George Orwell. 1984. The internationally acclaimed dystopian best seller that some say depicts a prophetic view and a chilling warning to us all. The dire consequences for man, when propaganda is at its height; for when a government rules with an ironclad fist. War is Peace. Freedom is Slavery. Ignorance is Strength. The three phrases printed within the first few pages of chapter one, ring loud in today’s current state of chaos. From a modest background, Orwell was educated at St Cyprian’s on a partial scholarship until a place at Eton was available. He served for a short time in the Indian Imperial Police in Burma, served in the Spanish Civil War, and later, often wrote essays and articles for a paltry living. Experiencing communism, and labeled a fascist supporter, Orwell drew on his experiences with governments’ and various walks of life. At one stage, he experienced the streets of London, placing himself as a tramp and experiencing poverty first hand, accounting the hardened truths of social class in Down and Out in Paris and London. It was at this time the name ‘George Orwell’ was invented, not wanting to embarrass his family with the publication. But Nineteen Eight-Four held a mystique unlike other books Blair published under his pseudonym George Orwell. It followed acclaimed post war era Animal Farm, and was published in 1949. It was written at a time when Orwell worked mainly as a journalist, usually focusing on political content, and at a time when his health was failing him. By early 1950, George Orwell had succumbed to Tuberculosis. In a world of perpetual war, where governments concoct enemies and seed society with fear and propaganda, Winston Smith, the protagonist holds a job with the Ministry of Truth. Rewriting historical documents to levy up with current propaganda, ensuring the government doesn’t trip itself up, Smith craves a moment of freedom and dreams of rebellion. He secretly hates the ministry and is all too aware of the forgeries of documents and disintegration of history. Reflecting on today’s world, Big Brother is a term well understood in all its layers. But it isn’t the term we should heed to the forefront. War is Peace, in 1984, insinuates the necessity of a perpetual war to keep its citizens governed. If the citizen has something to fear then it has something to work against, to achieve, to believe. If the citizen is fearful, then the government has control. For the government, an endless war means a continual docile peace with its people. The Industrial Military Complex of today’s real world isn’t so far away from Orwell’s and Winston Smith’s world. Iraq, Afghanistan, Syria…now North Korea and the problems at the South China Sea are slung onto our media platforms as we become immune to the ceaseless ISIS campaigns. The government continually reinvents the war wheel to keep its citizens distracted. For the government, Freedom is Slavery. Fiction and non-fiction alike, the parallel between 1984 and 2016 is difficult to dispute. When 9/11 occurred, the face of the world changed. It was the pinnacle of what was to become an era of security, terrorism and surveillance. The War on Terror facilitated the government’s need to watch everyone. 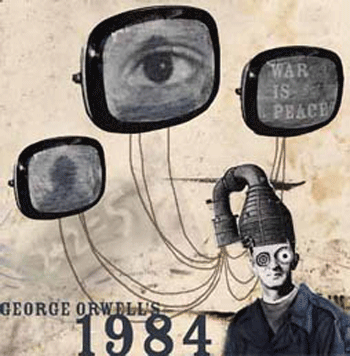 1984 depicts a Winston Smith as a slight man, miserable and all too aware of the screen above watching his every move. He rents out a room in hopes to escape the glaring eyes and ears of Big Brother. The paranoia he feels in the book is akin to our own today. Are we truly free from servitude? The Five Eyes Global Alliance, the Department of Homeland Security – amongst others…the Snowdens and Assanges of the world truly believe we are not. Is the government dumbing us down on a daily basis? From fluoridation in the water supplies, to a sub-standard education system, the list of 21st century problems dumbing us down is endless. But what about basic language skills? Newspeak: A controlled language, set to restrict and avoid ambiguity. Its aim is to reduce the need for words; and is designed to control the citizens. From Newspeak we see free thought lessened, suppressed and the individual becoming part of a collective government cog. (Mainstream media, Facebook, Twitter, etc.) There is no individuality and no room for self-expression. In one word it is pure censorship. In another, it is conformity. The very essence of these three slogans is “Doublethink;” a byproduct of Newspeak, where two beliefs are held true, though contradictory. Thought crime and the Thought police are also much of what we see today in our censorship leaders. Suppressing the freedom of thought and the ability to verbalize it (Political Correctness, anyone?) risks attack on your own ideology. It assists with the government governing and dealing with unorthodox actions. While we remain ignorant of optional ideologies, the governments of this world remain strong. Divide and conquer, they say. 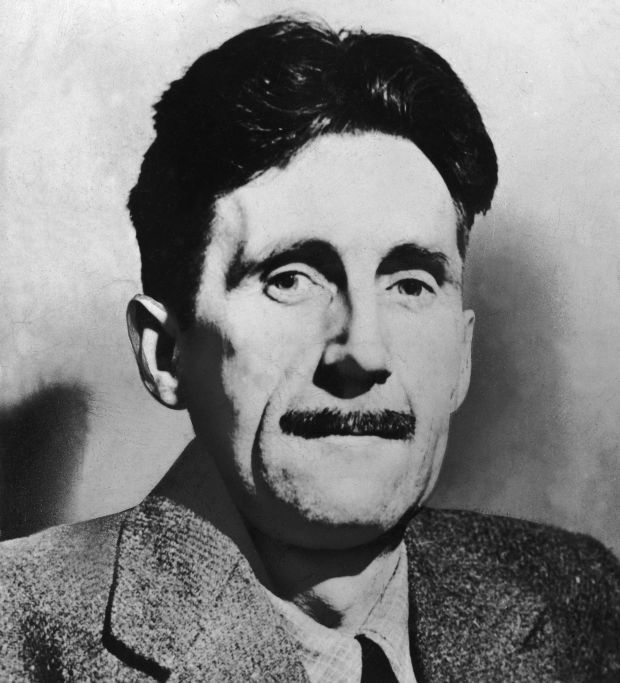 The glimpse Orwell gave us 67 years ago is more true to a warning today, than ever in the past. Rather than prophetic, Orwell, though his years of writing, serving in war and slumming it to get a true sense of poverty; his understanding of man and the intricate nature of the government served only to tempt a prolific writer into documenting the writing on the wall. If he were alive today, one wonders how the world would silence him. Sources: Nineteen Eight-Four, Oxford Dictionaries, BBC George Orwell, Biography.com, Daily News, Privacy International, Defense One, Bloomberg.